Portland is a pretty weird place, cool, but weird all the same. That’s also perfect because Oregon State, although not in Portland is in the same state, is a pretty quirky program and they were at the center of one of the most bizarre coaching carousels in recent memory. Nebraska fired Bo Pelini, a guy who won a lot, and hired Mike Riley from Oregon State, a guy who hasn’t won that much. Then, the Beavers turn around and hire Gary Andersen, a guy who has won a lot. So to recap, one team voluntarily gave up a winner to hire a guy who, for lack of a better word, is a relative loser. The team who involuntarily lost a “loser” turns around and pries another winner from a superior program. Odd. Another odd quirk of Oregon State is that their two-deep is no longer available on their website or online anywhere that I can find. That’s bad for someone like me trying to project who will play for them, but I actually support the move. If I were a college head coach, I’d want outsiders and potential opponents to know as little as possible about my team heading into the season. Two guys that I do feel confident will get plenty of playing time and targets are receivers Victor Bolden and Jordan Villamin. Bolden had over 100 targets last season and led the team in receptions and yards. In fact, he had more than double any other receivers receptions and racked up nearly 800 receiving yards. Villamin caught 35 passes for 578 yards as a freshman last season. Beyond them, a guy I like to break out in the receiving corps is Hunter Jarmon, who caught 20 passes for 334 yards as a freshman. Storm Barrs-Woods is the only returning back to top 100 yards last season, but he did so by a wide margin with 766 yards for five touchdowns. Unfortunately, there isn’t much proven help behind him. Chris Brown (not the rapper/dancer or the “Smart Football” author) and Damien Haskins both had minimal carries last season and rushed for a combined 140 yards. The offensive line will benefit from the return of 2013 All-Pac-12 center Isaac Seumalo. Seumalo missed all of 2014 recovering from a foot injury. His best and most experienced fellow lineman is left tackle Sean Harlow. The other three linemen do all have starting experience, although their combined career starts sums to equal Harlow’s total of 21. No matter who starts at quarterback for Oregon State in 2015, the first snap of the season will be his first college snap. True freshman Seth Collins seems to be the front runner althogh it is likely that he will face stiff competition over the next few weeks from redshirt freshmen Nick Mitchell and Marcus McMaryion. Without much of anything to go on at quarterback, it’s pretty difficult to gauge just what the ceiling, or the floor for that matter, is for this offense. Plenty of new faces will show up on the defensive side of the ball too. 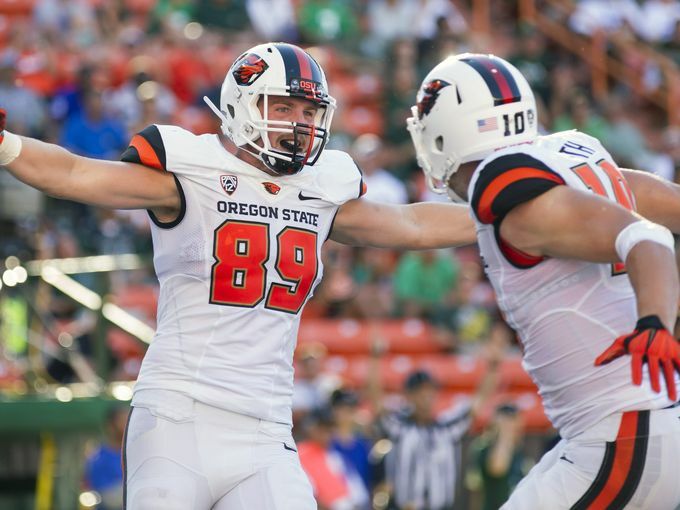 Oregon State will have to find nine new starters for 2015. The secondary does bring back three players who played in all twelve games last season. 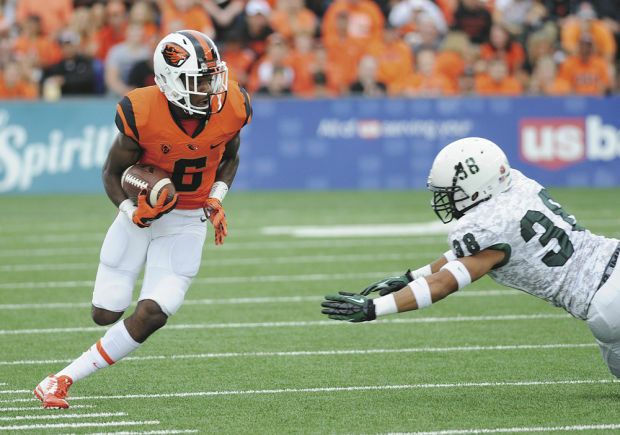 Cornerback Larry Scott had 35.5 tackles last season and broke up eleven passes. The other two are the guys who I can only assume will be starting at safety: Justin Strong and Cyril Noland-Lewis. The two combined for three interceptions last season. Unlike the secondary, no returning player on the defensive line played in every game last season. Defensive ends Lavonte Barnett and Jashwa James did play in ten games though and Barnett managed 5.5 tackles for loss, 4.5 of which were sacks, in his ten appearances. Once again these are my assumptions based on nothing but last years reps and stats basically, but I assume they will be the starting ends. Based on the same logic, Luke Hollingsworth or Jalen Grimble will be the starting defensive tackle, although neither of them had more than ten tackles last season. The linebacking corps will also be replacing three starters, and only two returning players played in a game last season. 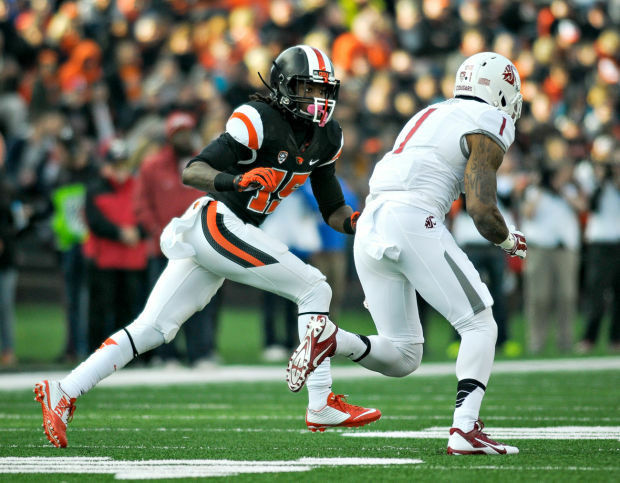 Both of them played in eleven of Oregon State’s twelve games. Rommel Mageo and Caleb Saulo combined for 21 tackles and half of a tackle for loss last season. That’s not much production, but it is better than nothing. Those two will be your likely starters at “Mike” and “Will” respectively, and my bet for the starting “Sam” linebacker is junior Kyle Haley. Pretty much everywhere you look for an Oregon State preview you see the term “transition year” being bandied about, and it’s for good reason. Breaking in a new coach, new quarterback and nine new starters on the defense in the same season is never easy. It’s especially hard when you are a team that historically has not won a lot, and your roster isn’t particularly indicative of that changing. However, the Beavers came away with a great hire and could compete in the North in the next few years with him at the helm.